Beer fest, sausage, Central european bank, Scorpions, Bismarck, Marx, World cup 2006 ... Why all these words? For their common factor: Germany, our nearby country, far in the East. A foreign and nevertheless close country. A culture which differs on certain points (school, respect for the traffic rules, the organization of cities, the language naturally, the breakfasts), but which is aftyer all not so far from ours. Then, of course, it's not a Latin country, its unity is more recent than in France (it was previously divided into several provinces belonging to the German princes). This unity was made around the Prussia during the XIXth century, period when the German national identity grew up. Who were the victims? It was us! The war of 1870 lost by France was mainly led by Bismarck around the awakening of this feeling in front of a common enemy (even if the relations between France and the Holy Roman Empire were never very good). At the end of the war, as you probably know, we lost Alsace and Lorraine, and it was one of the causes of the two World wars, even if there were other factors, with the consequences we all know. Today, no grievance to this nearby country anymore, "it is the past", not to forget but not to put on the back of the current generations. Since the Treaty of the Elysee signed between De Gaulle and Adenauer, the difficult relations between the two countries are finished and their status of "hereditary enemy" is erased. It is the reconciliation. To find Germany we know today, we have wait for October 3rd, 1990, day from the reunification between GDR (held by the Soviet citizens during the Cold war) and FRG (western block). 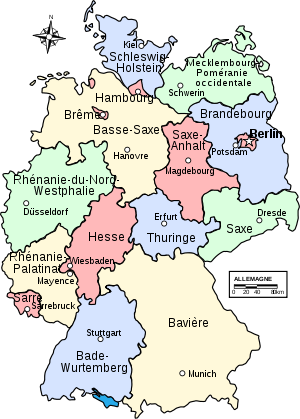 The country is composed of 16 Bundesländer (regions), and it's the country the most populated in the European Union (of which it is a founder since the ESCS of 1951) with more than 82 million inhabitants. Some big cities compose the country: Munich and its famous beer fest, Frankfort, seat of the Central european bank, Hamburg, Stuttgart and naturally Berlin, capital since the reunification. So, this accelerated course of German history doesn't want to make you work in your revisions, don't be afraid, it's only to introduce briefly the country which interests us. Why being interested in it? For many reasons with no doubt, but the one who is going to gather us is that it's the country of many bands of metal music with international reputation (there's a difference of culture with France here): Scorpions, Helloween, Gamma Ray, Accept, Rammstein, Kreator, U.D.O ... But especially Blind Guardian. A culture of metal music is very present over there, and the reputation of this one is known. In 2001, I discovered this country in school journey. Where? In Aachen, Aix-la-Chapelle in the language of Molière, not far from the Belgian border. This journey was interesting, even if today I don't remember many things about it. Why do I speak about that? Simply because not far from there, a little in the North, is the city of Krefeld, the "silk and velvet city" as it is sometimes nicknamed. Does this name evoke you something? Well, let us imagine that it doesn't, it was my case until I discovered Blind Guardian, a totally unknown city, in spite of its more than 200 000 inhabitants. It is there that the band, under the name of Lucifer Heritage, was born. So, we will analyse this city which is eventually unknown to us. More than 200 000 inhabitants, a big city thus, located not far from the border of Netherlands, in the east of Düsseldorf, in the "Land" of North Rhine-Westphalia. Until 1929, its name is Crefeld, and its history moved during modern time, it is in the heart of Protestant Germany, not far from Netherlands at war against Catholic Spain. In 1758, the city is the theatre of a battle, during the Seven Years' War. The Prussian troops fought against the French troops. It was a Prussian victory. Besides this history, which doesn't contain many important events, there's in the city a rather famous zoo (more than 350 000 visitors a year, more than 1 000 animals), a theatre, a team of ice hockey, a football team, a media library, a castle built on the shores of the Rhine in Linn, and a medieval festival since 1978 ... All that a city of this size can contain, after all! His current mayor is Gregor Kathstede, from the Christian Democratic Union. The city dates from Roman time, the legions created the camp of Geldulba (today the district of Gellep), its first name is Krinvelde. The city strongly developed during the XVIIth century, it is one of the rare cities more or less saved by the Thirty Years' War. Krefeld overpopulated, 13 families will find fortune on the West, on the New World, in 1683: they built Germantown (today integrated in Philadelphia). The city knew various statuses, belonging after 1702 to the kingdom of Prussia, then to Rhine Province. In 1872, the city becam independent. Finally, in 1929, it united with Uerdingen, city which suffered from the Thirty Years' War, to build Krefeld-Uerdingen, then in 1940 Krefeld. 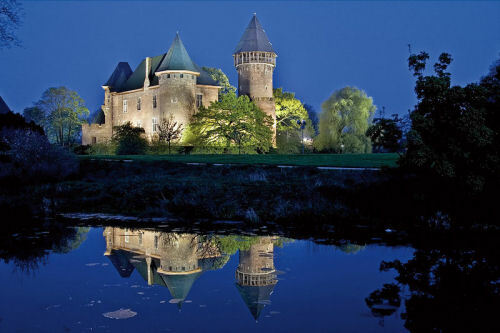 Krefeld is coupled with 7 cities, one from France: Dunkerque, since 1974. It is thus in this environment that our bards have grown up, Hansi in the business school where he met Andre. They played their first concert in the city in 1987 and organized there then several concerts for the fan-club. They played it the last time in November, 2007, in Königpalast. What else to say about this city where was born this group which we like so much? The main singer of a group pioneer in the electronic music, Kraftwerk, was born there, and a group from death metal, Grind Inc., was founded. No, our bards really don't find their musical influences within Krefeld, but indeed in Germany, this country of metal music.